Know what one of the best things about a hot rod is? The motor, son. “Of course,” right? But the decisions that are made around the engine for a hot rod are as much aesthetically driven, as they might be performance-minded. And, with not too rare an exception, even built purely for its looks (two words: Street Rod). Such was the group of reasons around the motor for this car: I bought the complete bone-stock ’53 Chrysler 331 Hemi in 2003, when they could be had for $400. At that time, I got more than a few ribbings over it from my good friends who called me a sucker for dumping any money at all into one of these early little Hemis that had the bellhousing cast into them (some 15 years later, those tunes have changed). 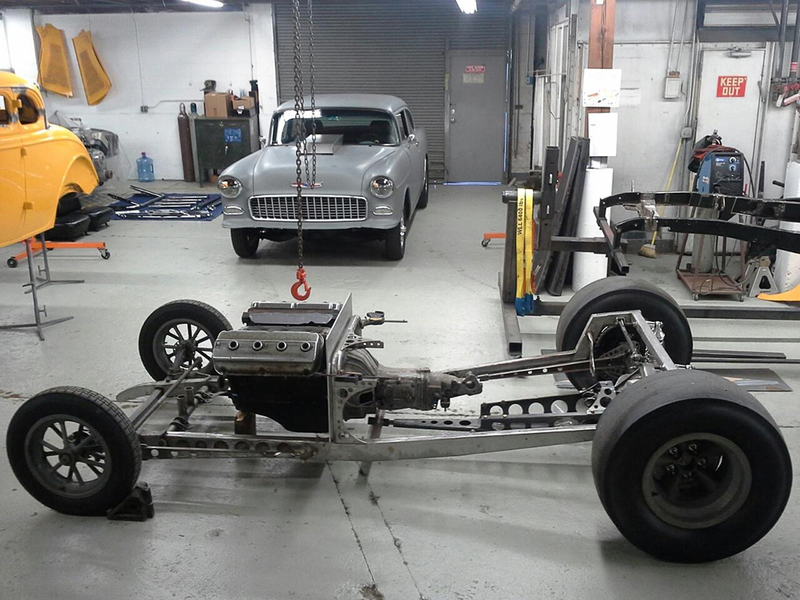 But, I wanted a Hemi for the same reasons I would never consider a Small Block Chevy: if the motor was going to be one of the largest, heaviest, most central elements of my T coupe, it was going to be a special one. Something that would command attention and, dare I say it, reverence. A Chrysler Hemi would check every box on the list. My ’53 Chrysler 331-cu.in. Hemi, in full hot-rod trim, painted, mounted to its GM Turbo 400 automatic transmission and being balanced on the cherrypicker by yours truly. Turns out, a cherrypicker can become woefully imbalanced, the higher in the air you get it. Go figure. Photo: Rolfe Brittain. I found my 331 convalescing in a miniature Spanish castle in what was a slightly rough part of San Francisco. Though the place was being used as a general contractor’s warehouse, it must’ve been a thing of beauty when it was first built in the Roaring Twenties as a swanky home. The rugs cut on the parquet floor this thing was resting on…I could only imagine. 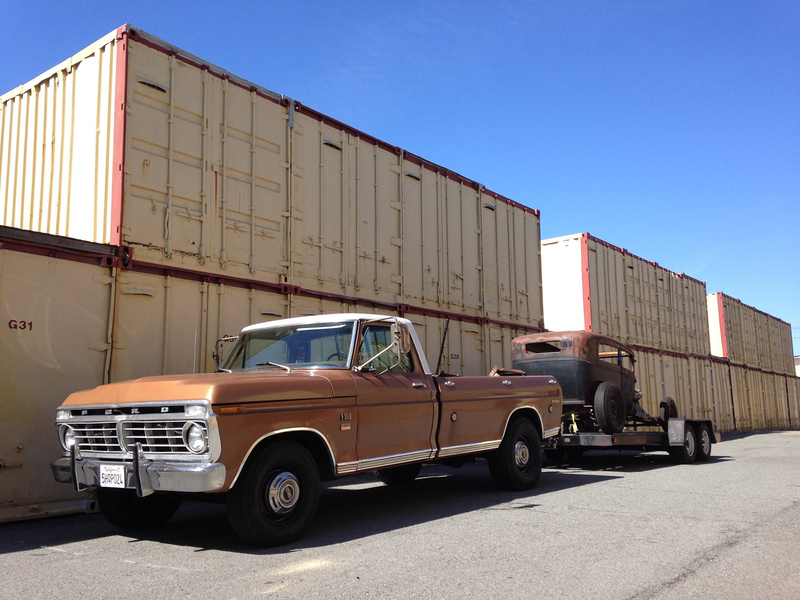 I collected all the parts, threw them all in the bed of the truck, and off it went to Reggie Jackson High Performance—Bruno Gianoli’s machine shop in South San Francisco. 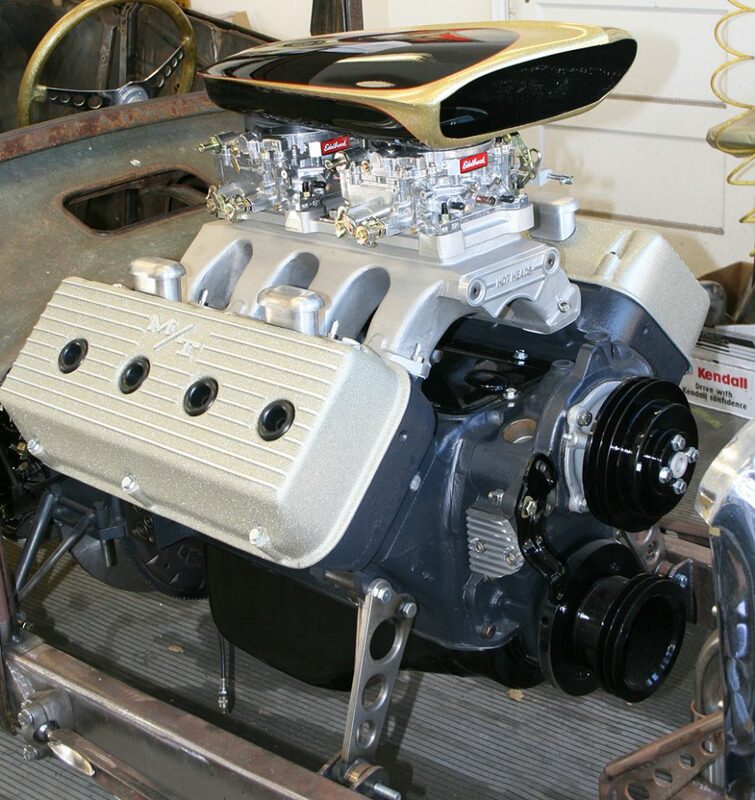 Bruno finished the rebuild; I tapped Bob Walker at Hot Heads in North Carolina for a bunch of go-fast Hemi goodies; Conder took pity on the wounded valve covers and stitched them back up, put a little glittery English on them and laid down the paint on the block. Topped it all off with the repopped era-correct fiberglass scoop that also got the Conder treatment. DONE. Ah, pretty, right? Warm green-grey paint on the block, specially mixed and laid down at Conder Custom, valve covers repaired and treated to what I can only describe as a “raw gold” metal flake ready for belts, and topped off by that Conder-prepped and scalloped scoop. So good. In order to tell this story, I have to back up to another one in 2004: then, the same friend who’d introduced me to Bruno Gianoli had called one spring day about a motor for sale. Dave is that buddy who knows absolutely everyone in your car scene—not much happens without him hearing about it. And he’d gotten a call from a long-time SF Bay Area gearhead who was trying to clear some space in his garage. 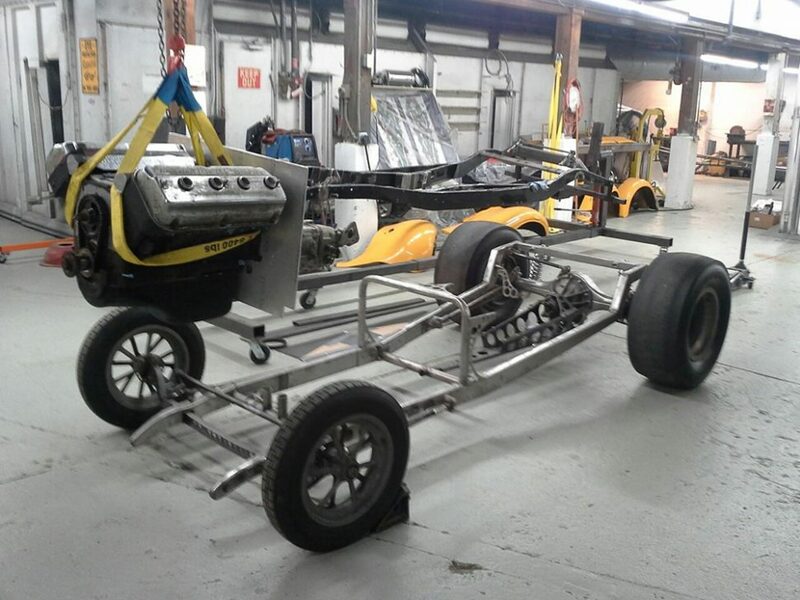 “There’s a flatbottom race boat with a Hemi in it and another Hemi sitting beside it on the floor. You interested?” I already had a Hemi, I told him. Besides; what was I gonna do with a damn boat? I passed on it and never gave that call another thought. 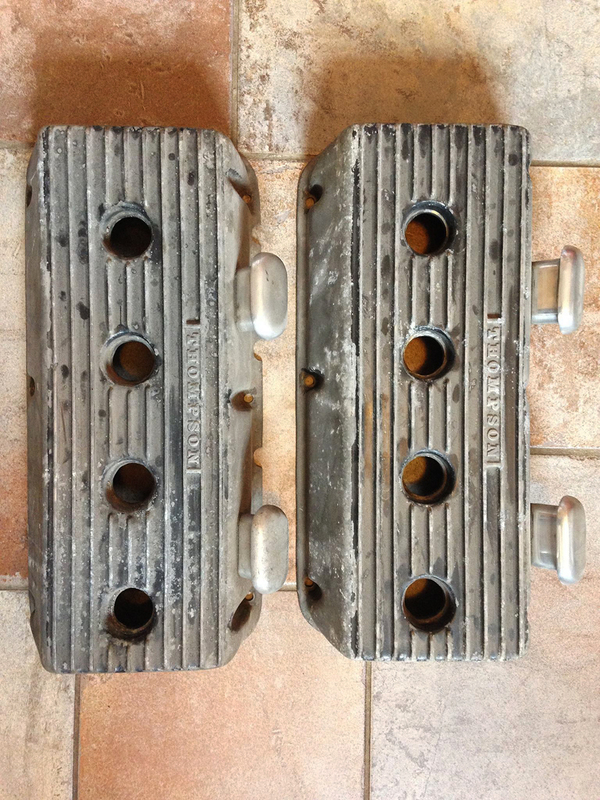 Till months later, when I’d heard through the grapevine that another mutual friend had scored a Chrysler 392 Hemi wearing some really interesting parts. 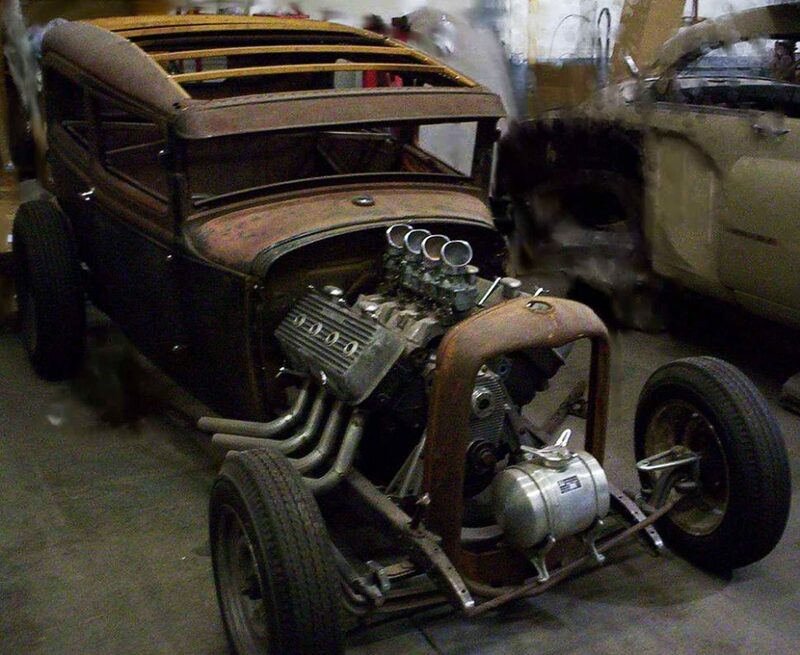 He was opening a hot-rod shop and he’d taken Dave up on the offer, scored the motor, and was using it for a customer’s Model A Tudor hot-rod project. 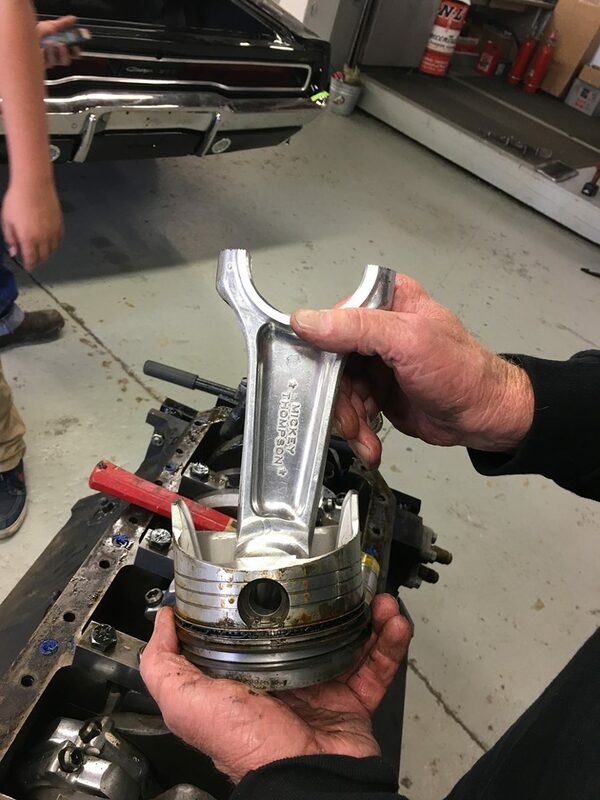 Nothing out of the ordinary about the transaction, but the motor had an oddly shaped chunk of steel wedged between its bottom-end and oil pan, not to mention a pair of magnesium “block letter” Mickey Thompson valve covers. News of this thing spread fairly quickly around town—and we all wanted to see what he had there in his shop. One of the shovel-nose flatbottom boats owned by Ray Sharp. In the late Sixties and Seventies, Ray ran a few of these on Northern California lakes with big Hemis from Gotelli Speed Shop. This may or may not be the motor I passed on, but it’s indicative of what Ray was buying from Ted Gotelli in those years and what he was using it for. Photo: Bob Sharp. 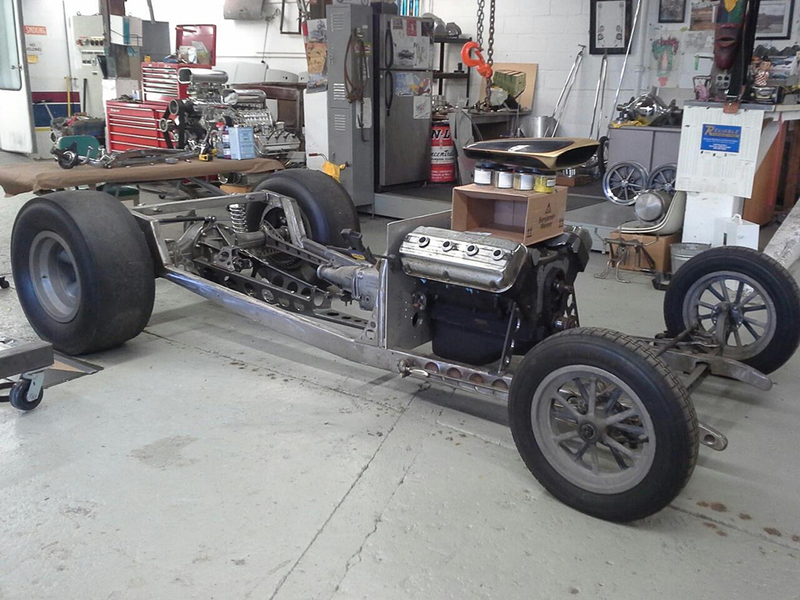 The 392 Hemi that Shea bought, settled between the rails of the Model A Tudor project he was building for a customer. Notice the 4×2 intake with frog-mouth scoops: the decision was made to sell off whatever intake setup the motor came with and just replace it with this deal that definitely had a more period-correct look for the style of the car. Photo: Shea Shawnson. Which is exactly what we got to do: the hot-rod shop was on the tip of a pier jutting out into the San Francisco Bay and we were all invited to it to catch the Fourth of July fireworks over the Golden Gate Bridge that year from its deck. By the time I was able to lay my eyes on this mythical beast, the valve covers had wisely been hidden away for safe-keeping, but that weird girdle on the lower half of it was in plain view. And it had a small, brass Gotelli Speed Shop tag riveted to it! The car and the motor, as I first got to see it at Shea’s San Francisco hot-rod shop: Here, you can see the vintage aluminum Nicson marine timing cover engine mount. Shea had decided to use it in the Model A project and it seemed to work perfectly fine on dry land. Close-up of the little brass tag that started it all. This thing is mounted to the side of the steel girdle located above the oil pan on the Hemi. If you Google that address, it still brings up the one and only Gotelli Auto Supply shop, operating in the same place since this tag was made. 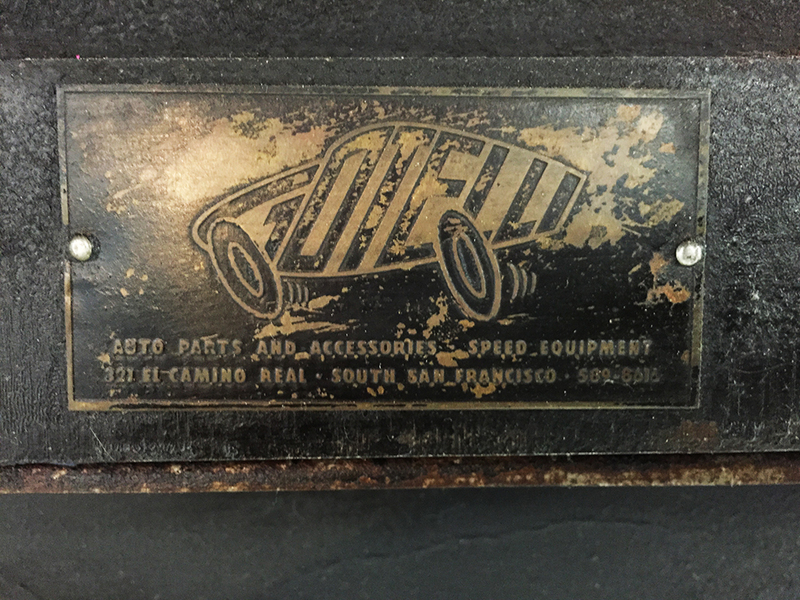 “Terrible” Ted Gotelli’s Gotelli Auto Parts was one of the great West Coast speed shops that played an integral part in the early days of postwar hotrodding and drag racing, and it still operates at its original address in South San Francisco. Bruno Gianoli was one of the players of that early decades-long passion play, but he was also one of the last men standing. Nobody knew anything about the strange girdle with the plate on it, but nobody seemed interested in asking Bruno—the one living soul who might be able to give some clues—about it, either. Shea recounting the story of how he and his customer came to own Ray Sharp’s Gotelli motor that Fourth of July on his San Francisco Bay pier. Color me enthralled. We all marveled at the motor and that little brass tag, drank beers out of cans, bench-raced, and speculated about its history. 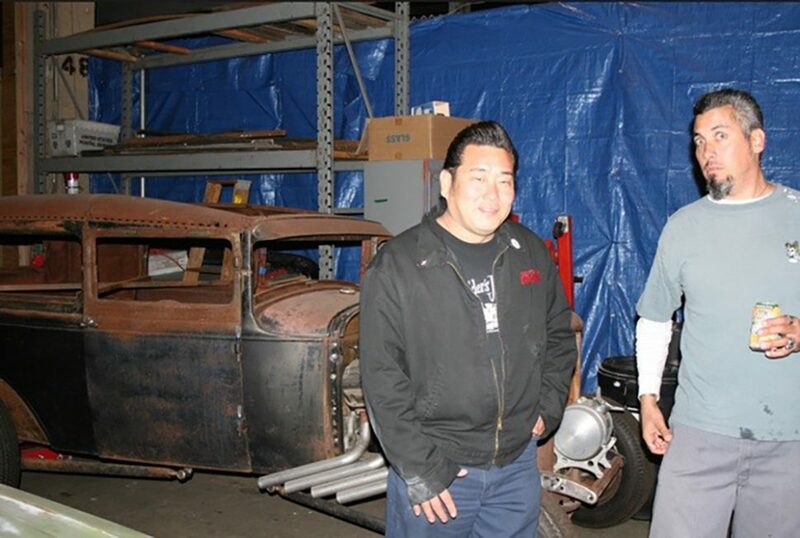 We had a blast listening to Shea—the shop owner—tell us all about how he and his customer went to see the motor and marveled at the sheer size of it. “Thing came up to here,” Shea said, as he marked his lower abdomen with his hand. 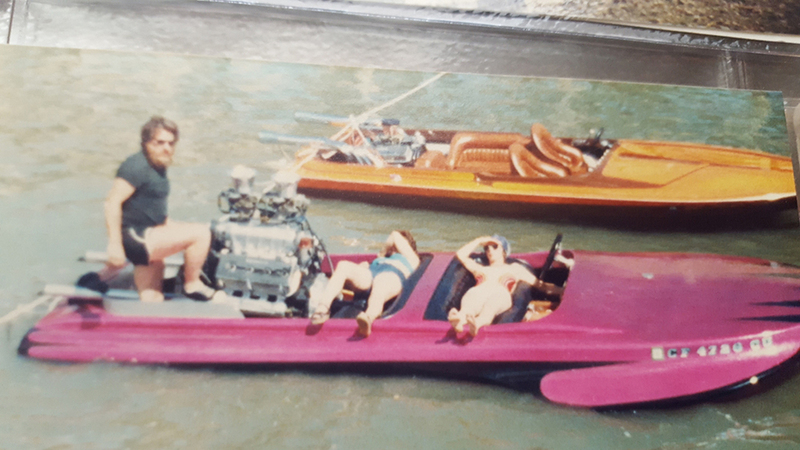 We all laughed and made wild bets as to what kind of exotic, race-prepped intake must’ve been on top of that motor and what it would’ve done to anyone crazy enough to get into that flatbottom race boat with it bolted to the stringers. Before I left his shop that night, I asked Shea to call me if he ever found out any more about the motor: “It might have an interesting story and I’d love to be the one to tell it,” I said. My buddy Dave—who first got the call from Ray Sharp about the motor years earlier—and me at Shea’s shop, car and motor in the background. Color me a little surprised by the camera. In the Spring of 2016, I’d heard about a stash of old cars way up north of San Francisco near Mendocino. Heard the ranch owner just wanted them gone, since the county had threatened fines or torches or at least a public tongue-lashing if they weren’t moved. As a self-respecting car guy who happened to own a truck and trailer, I jumped on it, of course. Called Dave and told him we had a responsibility to make a run north to at least see what was what. But, it was a Saturday in the spring in San Francisco, which meant at least an hour’s worth of traffic just getting through the city to the Golden Gate Bridge. By the time we hit Novato, California, dusk was upon us and Dave made the wise recommendation to call it, turn the rig around, hit the 2AM bar in Mill Valley for a few pops, then figure out what the rest of the night would hold for us. By now, Shea happened to be finding much success as a bartender at one of the oldest bars in San Francisco. Which meant we had some friendlies there and Dave suggested we get back into the city and go see him. So, we drove an empty ’74 F350 and flatbed trailer right into the busiest neighborhood in the city on a Saturday night, gave the gas station attendant across the street $10 to let us park the rig at the pumps for a few hours, and skipped across the street for a few drinks with Shea. As we sat at his bar and told stories, Shea said, “Hey, you still interested in that motor? I’m selling the whole project for that guy.” I couldn’t say “yes” fast enough. 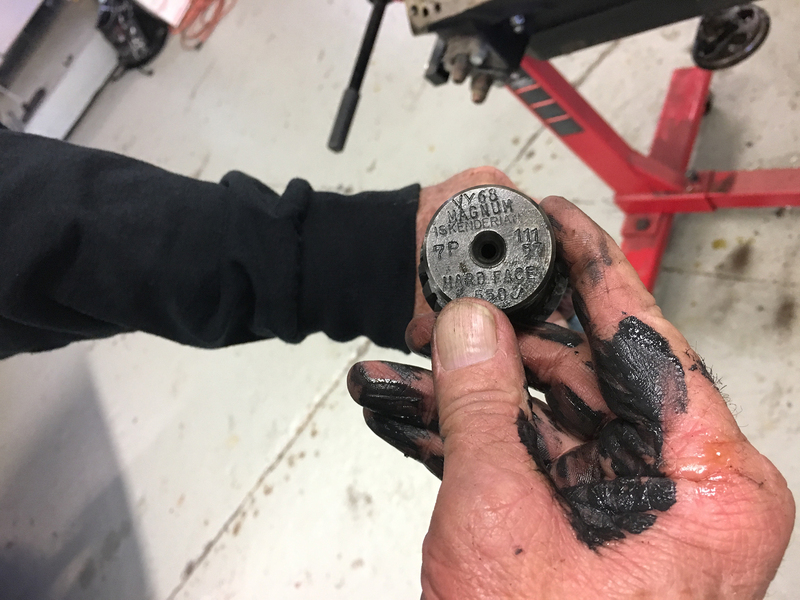 “But,” said Shea, “Don’t think you’re getting those valve covers!” We made the deal and, a few days later, I met his customer—a tattoo artist in the city—at his shop to trade the cash for the pink slip. As we talked about the motor in his Tudor, he mimicked the exact same description Shea had used: held his hand to his abdomen and explained how he had no use for such a radical intake and top-end. “So, we just sold off all that stuff on eBay,” he continued. I just about fell over. And then he mentioned those valve covers: “You want those? I’ve had them hanging here in my shop ever since we got the motor,” and pointed to the back wall. Not only had I just about fallen over, but now I was about to come out of my skin. As casually as I could muster, I said that I guess I’d take them, too. The day I took ownership of the Gotelli motor in its Model A Tudor carrying case. As crowded with tech crunchers and quickly turning brunch spots as San Francisco is, you’d be surprised how much of this stuff is still hidden in the most unsuspecting garages and storage units. Those valve covers, though. These early, magnesium “block letter” Mickey Thompsons are really rare. Heard that a guy restoring an old dragster actually borrowed a pair so that he could have a new set cast out of aluminum, since he couldn’t find originals. Not sure if that’s true, but these were valuable enough for Shea to hide in plain site—with breathers, too! A close-up of the Nicson marine timing cover that doubles as front motor mounts. Notice the blocks on either side of the crank hub: those are the ends of the main bearing girdle that the brass Gotelli tag is riveted to. I picked up the motor and its Model A carrying case from a shipping container rental in the city and delivered it to Conder Custom. Mind you, I reserved my absolute and complete body-quaking spazz-out over this score of a lifetime for Tim. 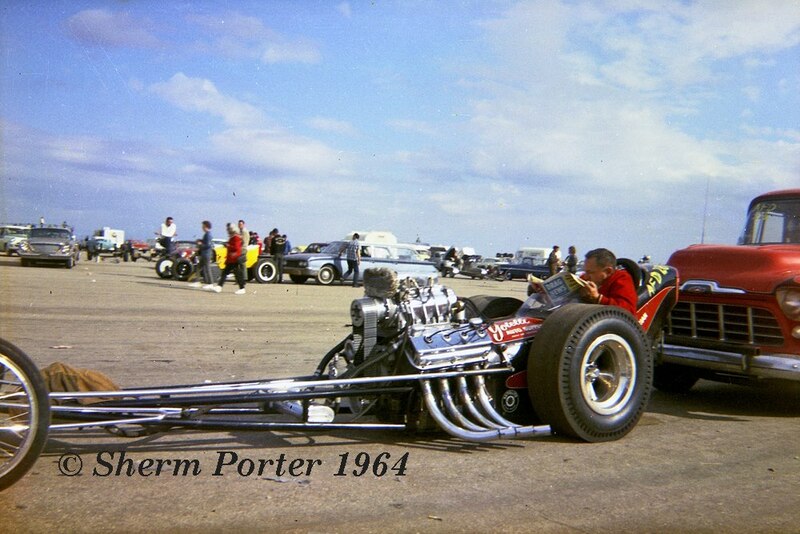 Conder had indoctrinated me in Northern California drag-racing history with his research for his own dragster project. 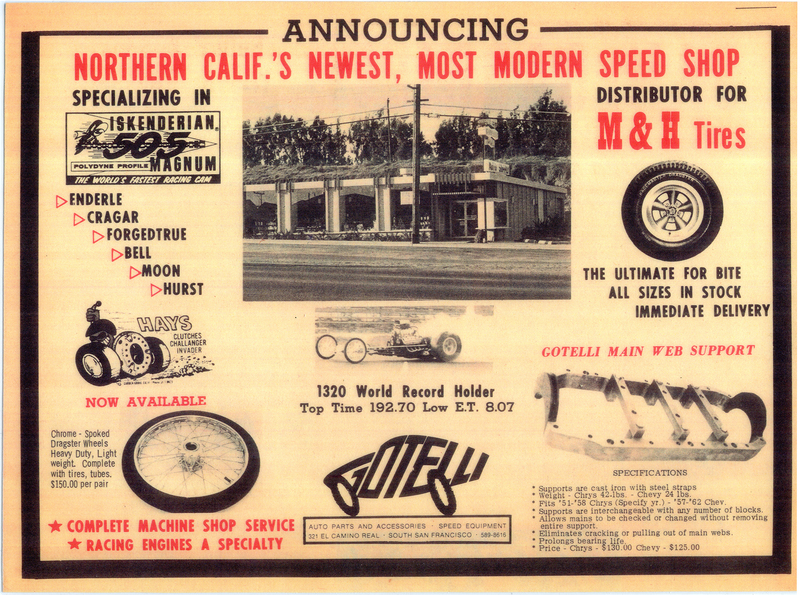 And Gotelli Speed Shop was at the epicenter of his work. Not only that, but Bruno Gianoli—the guy who’d built most of Gotelli’s dragster engines between the late Fifties and Seventies—was now back in the machine shop behind Gotelli’s parts counter, building motors on the same floor that he’d changed the world from, some 50-plus years earlier. We had no idea what the provenance of this 392 Hemi was, but I rolled the dice and sold the Model A with my Bruno-prepped 331 Hemi in it before I even made the final deal on Shea’s project, just to finance the whole shootin’ match. 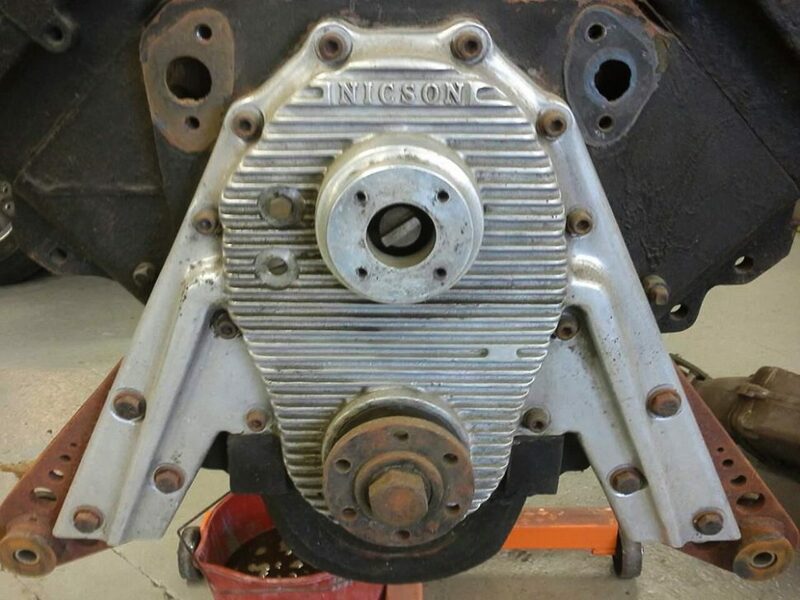 The motor, relieved of its 4×2 intake that Shea had mounted, the Nicson front cover and the pair of factory stamped-steel valve covers Shea had been using while the Thompsons were hung on the tattoo shop wall with care. 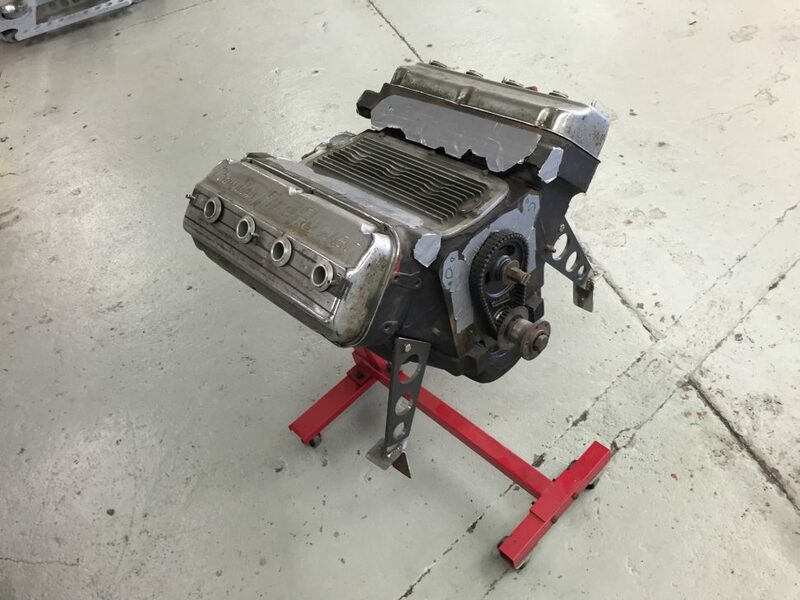 To sum up what I’d just done: I’d sold a perfect, freshly rebuilt, never-fired, complete Chrysler 331 Hemi so that I could buy a mysterious, incomplete, dirty old 392 Hemi with dubious history and boat-mounting hardware bolted to it. Because, HOT ROD. Tim cracked open that 392 and sent me phone pics of its guts: the rotating assembly was deceptively clean, but alarm bells went off all over his shop when he found a Frankensteined crank, gleaming Mickey Thompson cast-aluminum connecting rods, pistons that stopped short of the deck surface, and an Iskenderian “550” camshaft. Not only that, but there was a relieved section of that girdle where a starter seemed to have been used—possibly in the boat it patiently sat beside for some many years. We called drag racer and former Gotelli employee Pete Jensen to help us decipher the ancient code it refused to give up, and the news only got better: Not only was it some sort of fueler motor, but Pete was able to identify the block rock in the lower half of it as the stuff Terrible Ted had developed in his early Sixties race motors. “The ol’ man used a combination of cement and magnesium filings for the early stuff,” Pete explained, “And then replaced the mag shavings with walnut shells by the late Sixties. You’ve got the magnesium recipe, here.” BOOM. 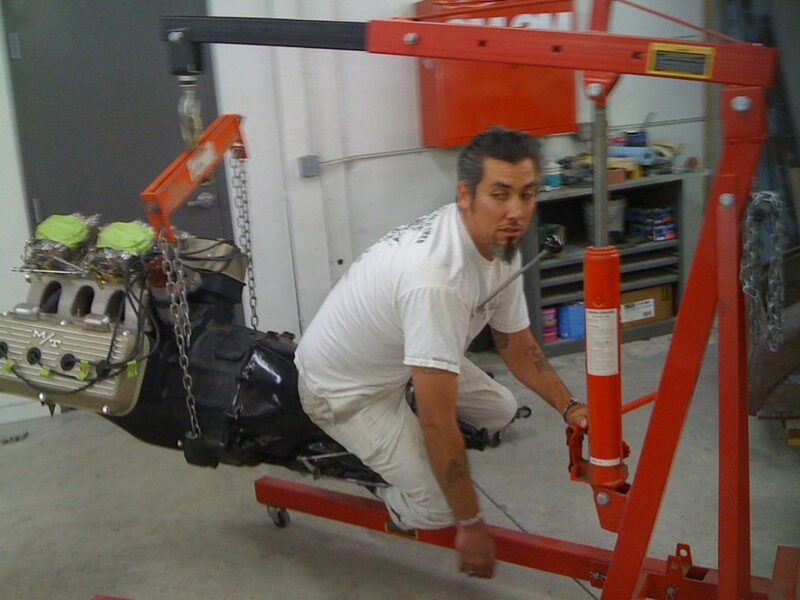 Pete had just dated the motor to the first half of that decade. 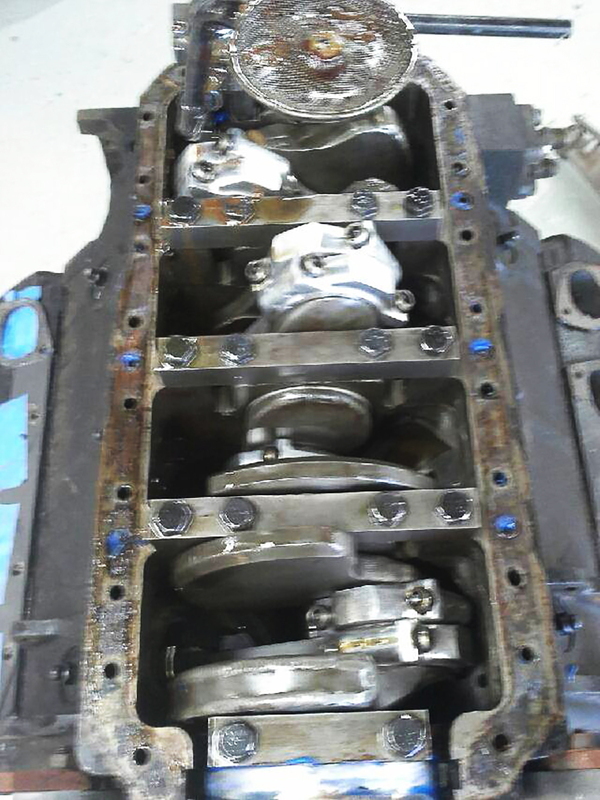 This is what Tim found when he turned the motor upside-down and pulled the pan: that Frankensteined crank is CRAZY. And those main caps…my heart skipped a beat as soon as he sent texted me this shot. Blurry because he was probably freaking out as much as I was. 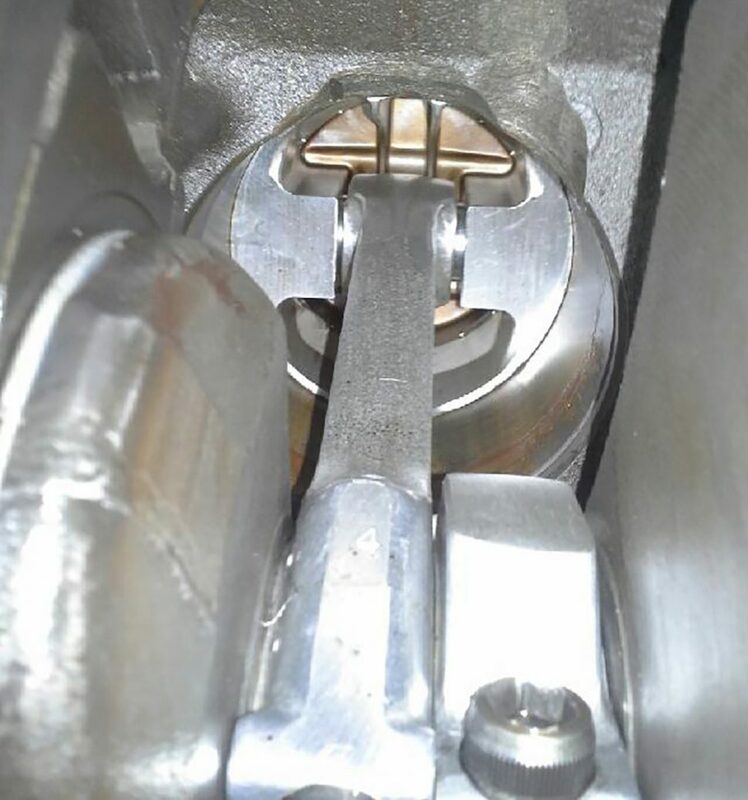 Close-up of the welds on the crankshaft. 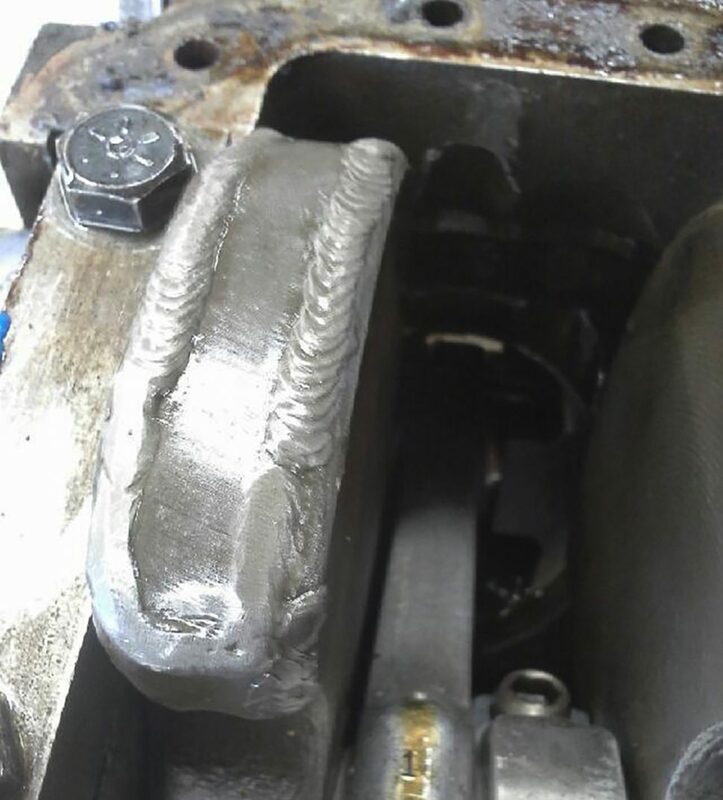 I’d never seen anything like this, but then again, it’s not like I have any experience with race motors, so there’s that. I barely understood what I was looking at, but I was determined to find out. The Iskenderian 550 cam in Pete Jensen’s hands. Another wonderment that holds so many mysteries to me. SO much to learn, but can you imagine a cooler teacher? But what about that girdle? Pete thought that Gotelli’s had designed and sold them for a year or two in the early Sixties—quite a few years before he was old enough to work at the shop, but he vaguely remembered them. I stopped by Gotelli’s one afternoon before Bruno left the shop for the day to find out more. “You gotta remember,” Bruno started in on me, “in the early days, The Goat (Terrible Ted’s other nickname—Ed.) would buy those big Hemis a half-dozen at a time, for fifty bucks each, cuz he’d go through so many of them every weekend at the track. So, we made that main bearing girdle so the motor would survive a race weekend and we could use it again.” But, like so many other inventions of the era, a competing shop saw the girdle in action at a track in Southern California, ordered one from Gotelli’s, tooled-up and was selling its own version of it in no time. “Once we saw that, we knew it was all over for ours,” Bruno explained. All of this took place over the course of 1962 and 1963—another clue as we zeroed-in on this motor’s history. And I couldn’t believe my luck, as its new owner…nay, steward. The motor, with its blank firewall sandwiched between it and the 4-speed, ready to be fitted between the Model A rails of my T coupe’s chassis. GIDDY. Whatever this motor was, it was at least a 392 and it had some sort of racing history. The motor and 4-speed located by way of the firewall attaching to its hoop. Notice, too, the cardboard intake manifold and blower, the metalflake container 4-port fuel injection and the scoop. That’s skunkworks-type stuff, right there. Don’t tell anyone that I showed this to you, mkay? As we poured over every photo we could find of every Gotelli dragster campaigned across the Sixties, I was convinced that if we just concentrated on any shots that showed a Gotelli car sporting these particular ‘block letter’ Thompson valve covers, we’d know which version of that race car this motor ran in. But motors were changed like underwear back then and it was the rare exception that a fueler motor would survive a weekend, much less a season, much less a generation. And every time I heard that argument, I’d come back with a ‘yeah-but’ and point to the girdle that was specifically designed to prevent exactly such a demise. So far, I was winning that argument and had the iron and steel evidence to prove it. The ad that Ted Gotelli ran in magazines in 1962. On the lower right, notice the girdle that he sold for a year or two before it was copied by a larger shop and sold in volume. The dark sections bookending the iron and steel parts are actually rubber—and that’s exactly what this motor features. Photo: Gotelli Auto Supply. Ted “The Goat” Gotelli, himself, sitting in the early version of the red-and-black Gotelli fueler, reading an issue of Drag News. This photo is watermarked as circa 1964, but it’s more than likely an image made in early 1962. Photo: Sherm Porter. 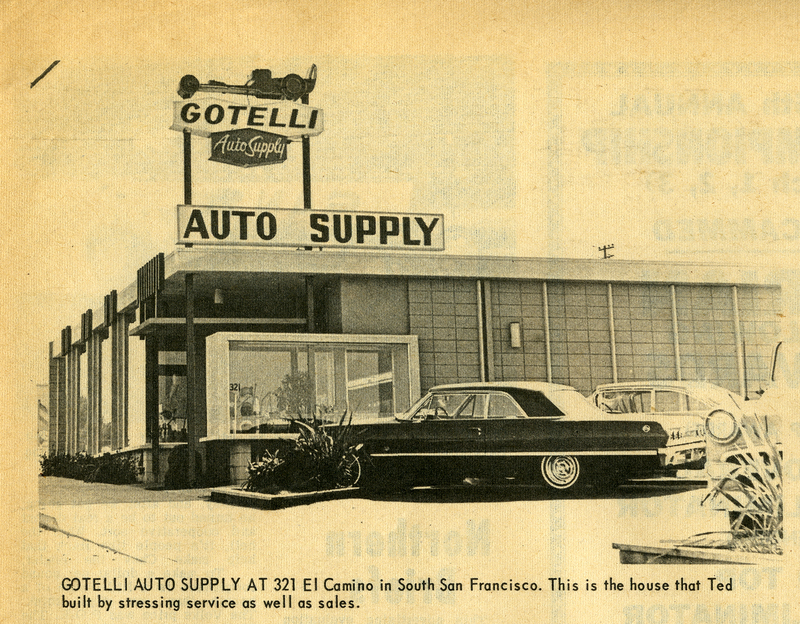 A photo of Gotelli Auto Supply—still in the same location in 2017—from a Drag News article on Ted Gotelli from 1962. Notice that amazing neon dragster sign on the roof. Makes my head spin, wondering where that thing disappeared to. Photo: Drag News. 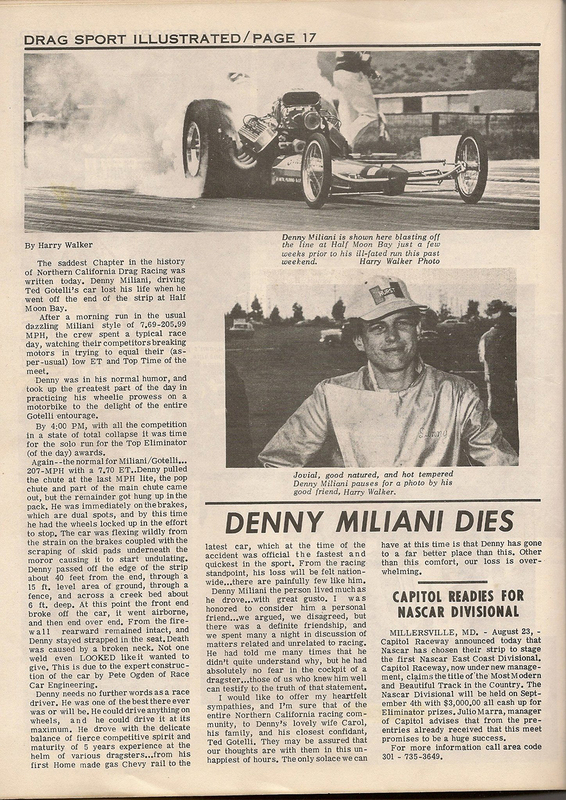 Gotelli pilot, Denny Miliani’s obituary in Drag Sport Illustrated in 1965. Many have claimed Denny’s death was the end of the most celebrated era of drag racing. Is it possible that Denny ran this very motor that I now own? I get light-headed just thinking about it. Photo: Drag Sport Illustrated.